You know how from time to time I like to interpret my dreams? Last night I dreamed of strawberries. There were these huge strawberries in my dream and my friend Melinda and I were picking them. We were eating some of them and others we were putting into baskets. 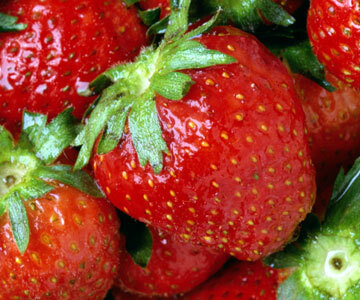 Melinda said: "This is going to be a wonderful year for strawberries!" I remember I was wondering about the season. I was thinking: But strawberries come out in the spring! Well, I figured this was a fall strawberry crop. Just now I looked up strawberries on one of those online dream dictionaries. It says: "To dream of strawberries, is favorable to advancement and pleasure. You will attain some long wished-for object." That might mean that I will complete my book about Leonard Pennario soon as I am hoping to. And I like the spring/fall note. Something that you normally would have expected to enjoy earlier, you now enjoy later. Better late than never! Oh well. I tend to think of dreams as reflecting our state of mind. I do not look to them to predict my future. But still, all I could think was, it had to be a good sign of something, to dream about strawberries.